CASP is a non-profit, charitable trust carrying out field- literature-, and analysis-based geological research in prospective hydrocarbon basins. Funding comes entirely from subscriptions by the oil and gas industry. CASP members of staff publish the results of their research in internationally renowned peer-reviewed scientific journals after a suitable delay. Fieldwork forms the core of CASP’s work. This not only involves field descriptions and photographs of rock outcrops, but also the collection of samples for analytical work back in Cambridge. In the CASP laboratory, microscopy is a core element of the research work to enable the samples that have been collected to be studied and categorised. When it was established in 1975, CASP focused on geological research in sedimentary basins of the Arctic, but its activities are now worldwide, with current active projects in Russia, Greenland, Canada, the Black Sea, the Adriatic and Ethiopia, among other locations. Another area of research is the North Atlantic Margins, for which Dr Simon Schneider is project leader. He received a PhD in palaeontology in 2010 from Ludwig-Maximilians-University, Munich. Dr Schneider explained, “The fossil specimens that we analyse are often a few centimetres in width and similar in height. In addition, we look at a lot of 30- to 70-micron rock thin-sections made using a diamond saw and grinding machines, and these also measure several centimetres across. “To view some of the fossils satisfactorily under a microscope, we need a range of different magnifications and more importantly a reasonable working distance. 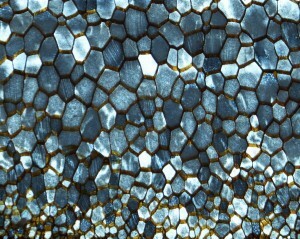 Magnified 600 times, this photomicrograph shows biogenic calcite crystals of a bivalve shell (grey) and their organic interlayers (brownish) viewed in cross section. The compound of crystals and organics is what makes shells both durable and elastic. Cyanobacteria (the feathery structures in the central part of the left) encrusting a potential plant stem (the dark element in the lower leftcorner). The ac tual plant has mostly rotted away and been replaced by diagenetic cements. The cyanobacteria are in turn encrusted by layers of travertine. The width of the sample is 3.5 mm. 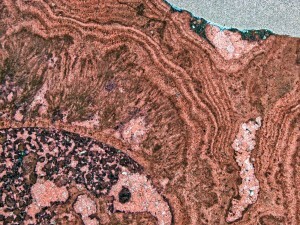 The alternative was to use a powerful Nikon monocular microscope that had been in use at the laboratory for many years, but its x200 to x2,000 magnification range was too high to allow Dr Schneider and his colleagues to assess the larger samples in detail and to characterise easily the mineral and fossil content of the rocks. The latter instrument was fitted with a Nikon digital microscope camera, so when CASP’s researchers looked for a more efficient, lower power stereomicroscope for their needs, the prospect of a model from the same manufacturer was attractive, as the same camera could be used on both microscopes. Nevertheless, a number of different makes was reviewed before a Nikon SMZ18 research stereomicroscope was purchased in the spring of 2015 from Nikon Metrology, Derby (www.nikonmetrology.com). The microscope has macro and micro imaging in one manually controlled instrument for convenient viewing and manipulation of samples. A high performance lens provides clear images with uniform brightness across the entire field of view. Simon Schneider is not the only researcher at CASP to benefit from the new microscope. Dr Michael Flowerdew, who received his PhD from University College Dublin, is a geologist specialising in geochronology and isotope geochemistry. He uses the instrument for extracting zircon grains from mineral samples for radiometric dating purposes. Another regular user is Dr Li Guo, who received a PhD from Cardiff University, and mainly studies the composition and genesis of travertines, which are limestone deposits formed by hot springs. Dr Guo has recently used the camera to obtain photomicrographs of a 3.5 mm wide sample of fossil cyanobacteria, which obtained their energy through photosynthesis and thus grow in shapes similar to algae. The bacteria colony studied was encrusting what appears to be the stalk of a plant. However, this stalk has mostly rotted away and been replaced by diagenetic cements. The cyanobacteria are in turn encrusted by layers of travertine, the above mentioned, layered limestone.